Fashion hotel Modez opens, with international renowned Dutch fashion designers designing the 20 rooms. 50 shops in the street filled. shrank, support for the local shops decreased, and vacancy rose. Time and time again, drug lords were evacuated but shortly returned. By the 1989 violent eviction of the drug lords, the residents vindicated. 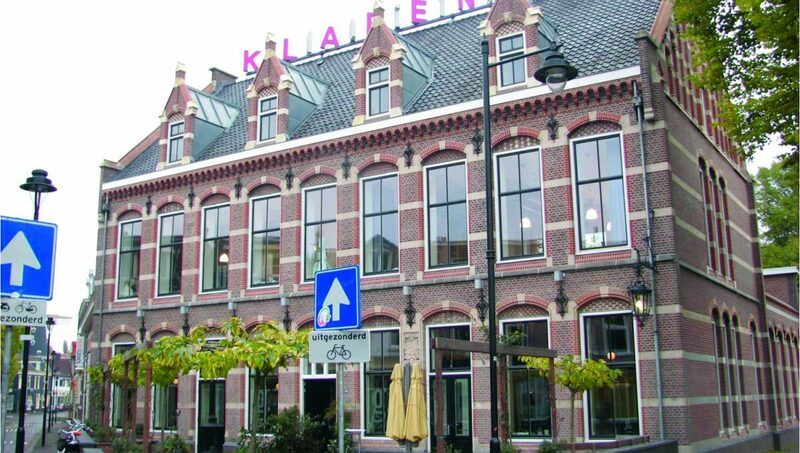 After a decade of planning in the 1990s, Klarendal’s revitalisation plan was finally launched in early 2000s. Since then, it has experienced positive changes. The mostly working-class residents were proud of their neighbourhood, the surrounding large industries, and the historic charm of Klarendalseweg. After the 1989 final riot, the major question remained: how can we turn give positive means to this neighbourhood? With nearly every shop on the main street closed, a high-unemployment rate, criminal behaviour and low incomes, what are the options? 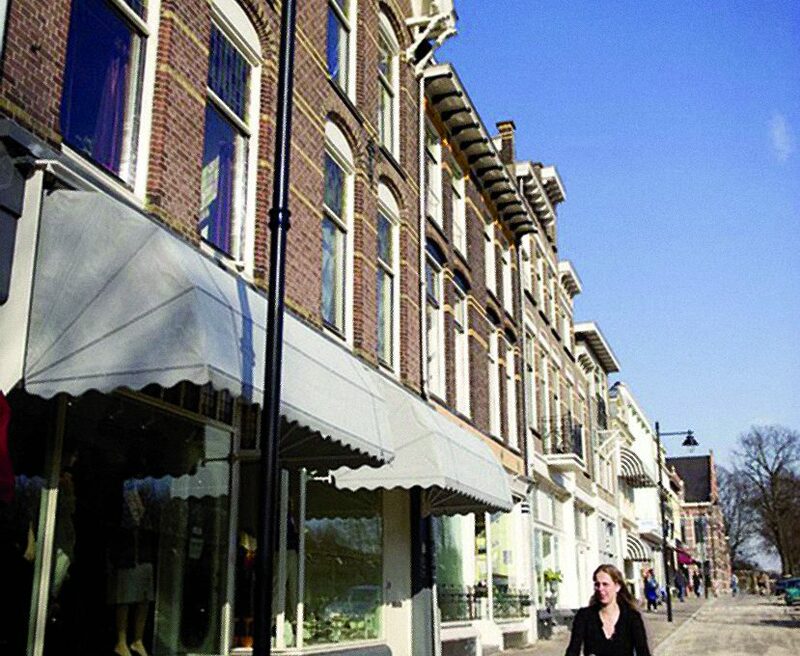 In the beginning of the 21st century, a strong partnership formed between residents, the local housing corporation Volkshuisvesting Arnhem, Provincial Government of Gelderland, ArtEZ fashion school, and the City of Arnhem. Because of the relatively low rents, the neighbourhood was already developing as an alternative, artistic community with many students from ArtEZ living there. At the same time in Antwerp, the haute couture icons The Antwerp Six were sweeping the Flemish city and revitalizing the city with them. This success story inspired the partners of Klarendal to expose the connection between art, the neighbourhood, and ArtEZ. From this inspiration came the birth of the Mode Kwartier (“fashion district”). In 2005, renovations of the shops began, paid by the housing corporation. 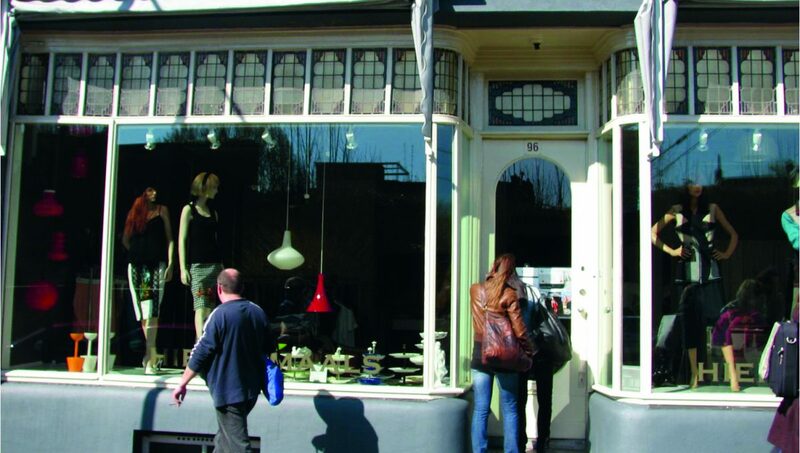 A group of postgraduates from ArtEZ and other academies were invited to rent vacant shops along the Klarendalseweg. The artists kept studios on the ground floor and lived in the space above. The post-graduates paid market value rent and were required to design their shop. In 2008, the reconstruction and relocation of Arnhem’s historic post office from the old centre to Klarendal and the opening of a new restaurant in it, marked an image change for the neighbourhood. By 2010, 35 studio shops were filled; now, more than 60 are filled. Residents contributed to the regeneration of the neighbourhood, the developing of plans and by beautifying other parts of the district. Acupuncture intervention. 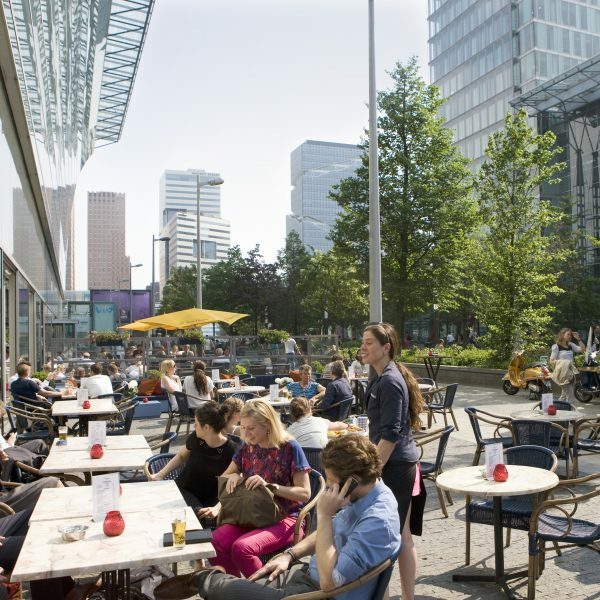 Beginning with the restaurant opening and the reconstruction of the historic post office, the partners applied a revitalisation strategy that pinpointed a host of interventions at various locations along the Klarendalseweg corridor. The street was redesigned at certain segments to enhance the pedestrian atmosphere. And of course the post-graduates’ art studio-lofts, not only played a key role in keeping the street alive at all times of the day but created a destination and walking route for friends and visitors. Creating a buzz. The 2008 reconstruction of the post office and the new restaurant Goed.Proeven (‘Well Tasting’) were huge image-builders for Klarendal’s revitalisation programme. This provided an official ‘opening’ for the street, especially for those unfamiliar with the neighbourhood and its recent improvements, and immediately made the street a buzz-worthy destination. In 2012 there is a second big opening because of three new additions: fashion hotel Modez & café Caspar, art space Kunstkazerne and gallery / workspace Plaatsmaken. The goal is to tell the world about the new Klarendal. Develop consistency. Because of their unpredictable travel plans and general hectic lifestyle, a major challenge with the string of artists’ studios is organizing common opening hours. A coalition or leadership team among the artists would be helpful in creating a consistently vibrant main street. neighbourhood. They fear too much change. Prioritizing residents’ satisfaction, buy-in, and input on upcoming long-term changes may have brought more collaboration, support, and positive impressions. Of course the Mode Kwartier project has gained attention and international press but it has also helped the city of Arnhem by enhancing the image of the forgotten artist neighbourhood. The renovations, filled plinths, and street redesign have increased liveability in the neighbourhood. In 2013 the project has been awarded the Gouden Piramide, the official Dutch government’s award for inspirational development. The jury called it impressive and praised the cultural, societal, economical and educational dimensions of the project. With an action-packed and violent history, the group of partners and post-graduate artists came together to create a destination corridor outside the city centre of Arnhem. The diverse neighbourhood had a solid base for evolution with the original proud residents, a constantly changing immigrant population, and the creative class from ArtEZ taking advantage of the lower rents. An acupuncture intervention strategy guided the slow change and created a situation for people to visit. Of course they have experienced challenges and are working their way through the kinks. 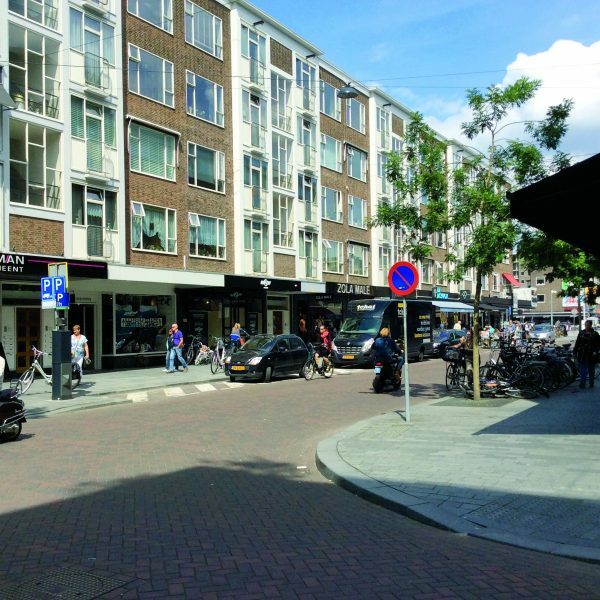 In the end, this project has given the trust back to the residents, reversed negative images of the neighbourhood, and contributed to a vital investment plan for the city of Arnhem.